Chili Peppers 'Cayenne' (Capsicum annuum 'Cayenne'): growing, planting, caring. 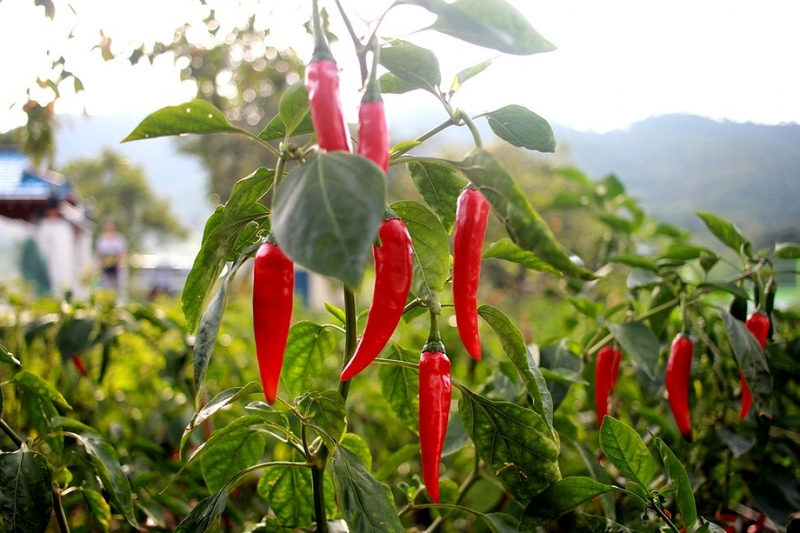 The cayenne pepper is a moderately hot chili pepper, with fruits up to 10 to 25 cm long, generally skinny, mostly red, often with a curved tip and somewhat rippled skin, which hang from the bush as opposed to growing upright. Most varieties are generally rated at 30,000 to 50,000 Scoville units. Frost-sensitive perennial plants with white flowering, rounded stems, and oval leaves from the Solanaceae family (the leaf brings to mind that of a potato, but the growth is more upright). The leaves are smaller than those of a pepper. Plant under cold frame in April or May according to the temperature (it must be more than 20°C), placing the plants 50 cm apart in direct sunlight in well drained fresh fertile soil. If you don't have a cold frame, wait until May-June and plant in the ground in the same type of soil. In May-June according to the temperature (it must be more than 20°C), placing the plants 50 cm apart in direct sunlight in well drained fresh fertile soil. Water well and mulch the plant with some comfrey leaves. To pot, choose a container that is at least 5L and plant in a mixture of rich potting soil and earth. The fruiting trim is not at all essential, but if you want a smaller number of bigger fruit, don't keep more than 15 per plant. If you want to keep your pepper during winter, you should shelter it in a room between 13 and 16 ° C. If it is in open soil, plant it in a pot of at least 5 liters. Place it in the light. You can take your Chili Peppers out indoors when temperatures approach 13 ° C regularly. Place it warm, in the light. Water preferably in the morning to avoid cooling the plants at the end of the day. Your chili peppers are fine with generous watering once a week if they are well mulched. After sprouting, water every other day for a few weeks with a light shower in order to have a slightly moist soil. Fertilization, like we usually advise, is used as a preventive measure at the beginning or end of winter in order for the microorganisms to have time to mineralize the organic waste you distribute. For peppers and chili peppers, we generally advise an additional fertilization during the growing season (such as nettle manure, not fresh manure). In any case, the pepper loves lye, thus you can indulge it by composting banana peels or by adding wood ashes.